This one is for all my friends who think I pull stuff off perfectly all the time. Today I’m going to share with you a bit of a disaster. A sweet, sweet disaster, but a flop none the less. 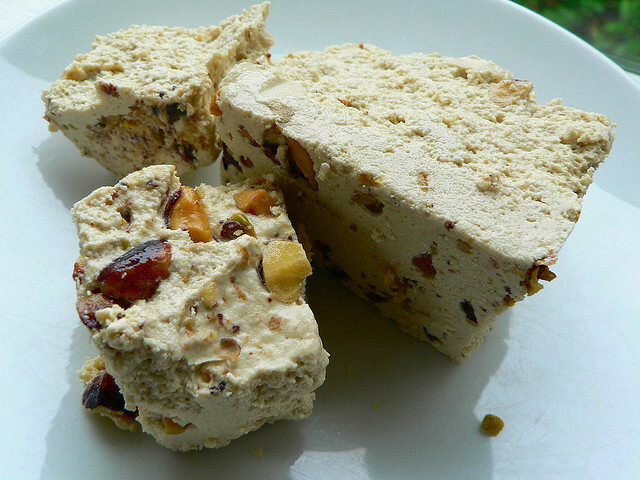 I was looking at halva (it has many other spellings as well – helva, halava, halawa, halawi, halwa) at the grocery the other day and upon looking at the price decided it might be worth my while to try making it. 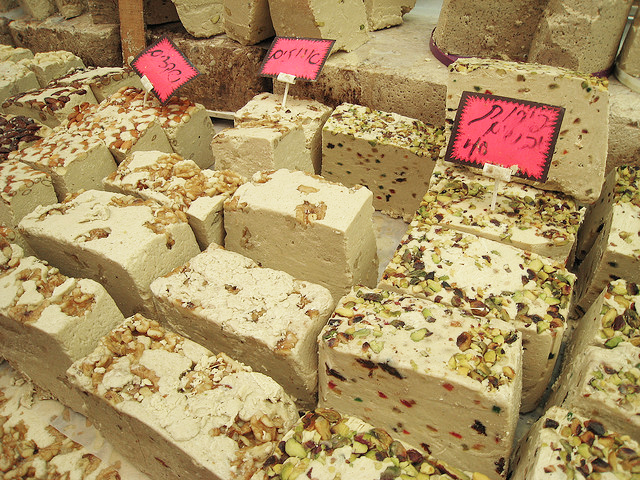 There are two main types of halva. One is made with flour, the other with nut-butter (usually tahini). I chose the tahini method. It’s what I was used to buying. Purchased halva (and I can only assume mine as well ) is a crumbly, fluffy sweet that is studded with (in my case) pistachios. The recipe tastes great. It’s just I didn’t pull it off. Rather than fluffy, it’s “creamy.” Not that it's bad, just..unexpected. Sort of like a very soft nougat. My halva tastes exactly as it should. It just doesn’t LOOK like it should. This recipe sounds like it should work. If anyone makes their own halva and can see where I messed up I would certainly appreciate a comment. The stuff tastes great. It’s just I know no amount of setting up in the refrigerator is going to render it the way it should be. I think the directions I followed were perhaps a bit sketchy. I believe I should have done the entire operation in the food processor rather than trying to “mix” with a spatula – maybe. It didn’t say specifically. The recipe came from a page that was associated with a dead link so I have no idea who to thank/blame…except me. Next time I’m going to cook the sugar longer to give it a harder structure. The stated temperature says hard ball stage, but 235°F is soft ball stage. That may be where I fell down. Here it is. If you do try it, the recipe makes a loaf pan nearly full, and it really does taste very authentic. I think with only two adjustments this recipe would have it down pat. Combine sugar and water in saucepan and bring to a boil. Cook to the hard-ball stage (a few drops of syrup, when dropped into small basin of cold water, will form a firm ball that will not flatten on removal) or a temperature of 234 degrees. Set aside. Put sesame paste with its oil in container of electric mixer or food processor. Add vanilla, blending thoroughly. Beat egg whites until stiff and fold into sesame paste. When thoroughly blended, gradually add 3/4 c of the syrup, stirring. When completely blended fold in nuts and remaining syrup. 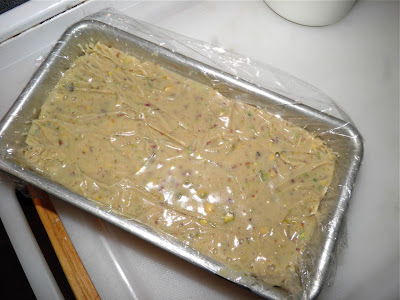 Pour and scrape mixture into loaf pan. Smooth over top. Cover tightly and refrigerate 3 days before unmolding. This halvah will keep for 6 months in refrigerator. Mine. Not fluffy in the least. But tasty... which is slight comfort. * I think I'll try 4 egg whites (as opposed to the inadequate 2) and change up the method. I'm going to whip the whites and then slowly incorporate the hot syrup directly into them like an Italian meringue, Then I'll add in the tahini/vanilla/nuts into that in the mixer. At the least it will be a different result. Darrell, was it a warm or humid day when you made this? I find egg whites to be very sensitive to atmospheric conditions. And 2 whites is not a lot compared to the volume of other ingredients; they have to do a fair amount of lifting. I wonder if those things combined led the halva to be less fluffy with a denser texture. Even so, I bet it tasted delicious! I LOVE pistachios. Yum! December update: After about 1 month in the refrigerator it became a solid. It's still not fluffy but was very good.